Years of understanding of this domain has helped us in presenting the best quality of Wheel Oil Seal. Rendered by us in various technical specifications, the quality of these products is always maintained. 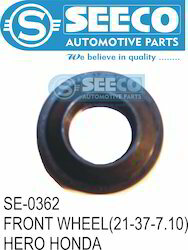 We are counted among the well-reputed firm for presenting an extensive range of Front Wheel Oil Seal to our esteemed customers. Due to our high technical competence and latest technology, we are indulged in providing a wide spectrum of premium grade Rear Wheel Oil Seal. >Robustly designed Main and Subsidiary Oil Seal Bogie Suspension is offered by us. >Our vendor’s professionals hold a proficiency in fabricating this range that adherence with the altering necessities of the patrons. Being a patron-centric firm, we have focused a lot in the quality of this array. Being a leading firm in this industry, we are deeply engaged in offering a high-quality range of Two Wheeler Oil Seal. Backed by knowledgeable professionals, we are offering an extensive range of Front Wheel Oil Seals. Our product range also includes premium quality Wheel Seal. These are manufactured using premium quality raw materials and are known for their damage-resistant and long service life.